Refugee Tushira Nabasirye was destitute in the UK for three months before being invited to live in the spare room of a London couple. Ms Nabasirye stayed with charity workers Anja Nyberg and Kristine Harris in their north London home for four weeks, before she was granted refugee status and moved to Stockton-on-Tees, where she now works and studies. Ms Nabasirye had to leave Uganda, where homosexuality is punishable by up to 14 years in prison, when she was outed as gay. She was introduced to the couple by Praxis, a charity which launched a hosting service for vulnerable migrants three years ago, and which found accommodation for 80 people last year, including 20 who were hosted by British families. Ms Nyberg, 37, who is originally from Sweden, says she had reservations at first about letting a stranger into their home but the couple were aware of the plight of migrants due to her partner’s work and they “decided to give it a shot”. They have now housed four women for varying lengths of time, from a couple of weeks to a couple of months. “Everyone says to us that we are such saints for doing this and it must be really hard, but we have been surprised at how easy it has been,” Ms Nyberg said. This is partly due to the boundaries laid down by Praxis, who arrange a meeting to discuss a contract which lays out clearly what everyone should expect. Praxis also takes care of all the practical support, such as helping with immigration cases. Puck de Raadt, a retired clinical psychologist who helped to found charities Bail for Immigration Detainees and Medical Justice, has been taking refugees into her home since 1998, when she went to Victoria station in London to pick up a Palestinian released from Haslar Immigration Removal Centre. “He spoke little English, was very depressed and had nowhere to go, so I took him home and put him on the settee. He found a job almost instantly, has not been unemployed since and never sought or received welfare benefits,” she said. Since then, she has hosted dozens of people, including a young woman who had to flee her family, who had threatened to kill her, a woman who was a victim of forced marriage and female genital mutilation, and a man from Côte d’Ivoire who had been tortured there and had also spent many months in immigration detention in the UK. He has now finally rebuilt his life and will qualify next spring as a plumber. Similarly, Ms Nyberg said what motivated her and her partner was the knowledge that “the Government systematically fails to take care of some of the most vulnerable people in our society”. Jean Demars, who set up the scheme for Praxis after working in the homeless sector, and who now works on a consultancy basis, said that although the charity can help some families, “there are thousands of migrants homeless in the UK, because of the dysfunctional Home Office system”. “People with insecure immigration status have no recourse to public funds, which means they cannot access homelessness services, such as refuges, as they require housing benefit,” he said. “These are people for whom no other provision exists.” As well as finding host families, Praxis also houses migrants, who would otherwise be on the streets, in shared flats and houses. “People don’t queue up to house people in their own homes,” he said. “However, in the past couple of weeks I have had a lot of queries from people interested in helping.” Because the Home Office is so slow at processing asylum cases, it is rare to place a refugee for less than four to six weeks and the average stay is around three to six months. Monday Hungarian authorities allowed refugees, who had been camped outside Budapest’s main train station for weeks, to board trains to Austria and Germany without visa checks. Tuesday The station was closed again following chaotic scenes as hundreds packed on to trains for the border. The closure led to street protests outside and thousands started to make their way to Austria on foot. Wednesday Shocking images of the body of a young boy being recovered from a Turkish beach began to appear on news sites and social media. Turkish media named the boy as three-year-old Syrian, Aylan al-Kurdi, who died with his mother and brother in an ill-fated attempt to reach the Greek island of Kos. Thursday Newspapers put the pictures on their front pages. The Independent printed an image showing Aylan lying face-down in the surf. Friday High-profile figures, including J K Rowling, added their support to calls for refugees to be offered sanctuary. Bob Geldof described the crisis as a “sickening disgrace” and pledged to accommodate four families. David Cameron announced Britain will accept “thousands more” Syrian refugees. He said the announcement was a result of the “scale of the crisis and the suffering of the people”. Volunteer organisation CalAid urged people not to drive to Calais, after convoys from Belgium and elsewhere in Europe caused disruption at the French port. They instead asked people to donate through centralised distribution systems. 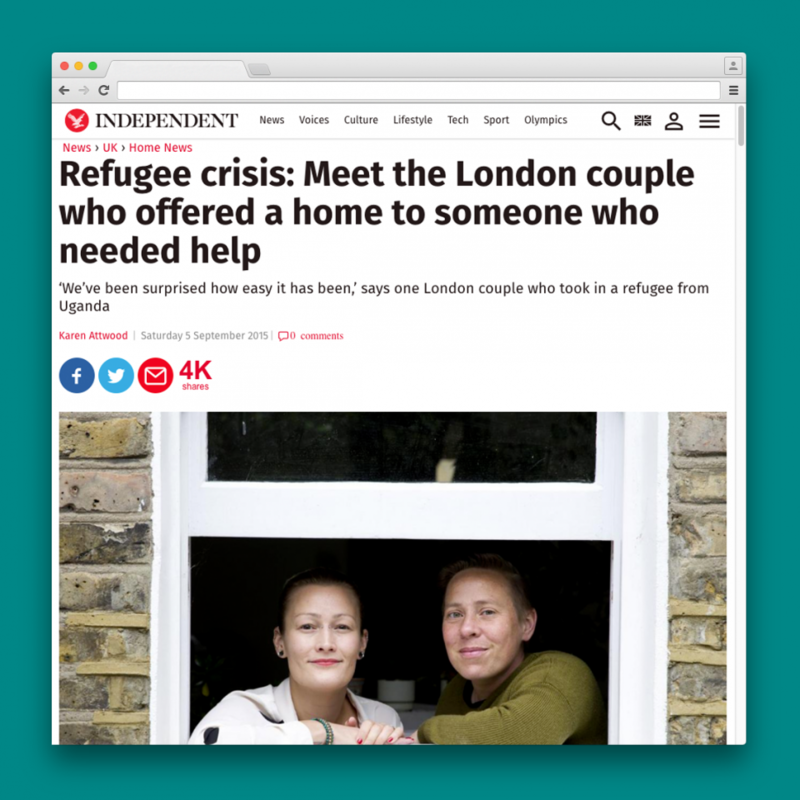 Crowd-funding website JustGiving said £280,000 has been donated in response to the refugee crisis since the beginning of August.